One of the more popular hair products that has been designed to help with hair growth or to prevent hair from thinning any more than before, is called FAST. 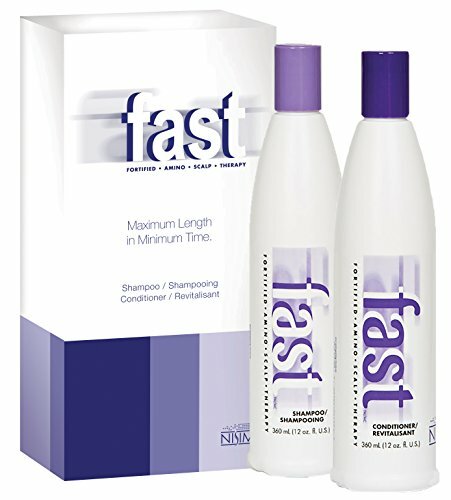 The FAST shampoo and conditioner has been specifically created to help people grow their hair quickly (hence the name!) and there are many people that have left positive reviews across the Internet. These range from people who have used the shampoo to help grow out a short hair cut more quickly, to people who have used it to help grow additional hair on patches that are balding or thinning. Nisim, who make the shampoo also claim that over 1.5 million bottles have been sold and that there are over 5000 positive reviews, so that can only mean that it is really good – right? Let’s look more into the detail. FAST shampoo and conditioner does contain a heck of a lot of chemicals and ingredients, all of which sound pretty scary, but it has been positively reviewed by magazines and other media, with favorable results. This is definitely not an off-the-shelf natural, organic shampoo product. The makers of FAST do say that the product contains non-toxic, vitamins, amino acids and herbs and that it is totally safe, so please don’t let the following list of ingredients put you off. Water, Sodium Laureth Sulfate, Cocamide DEA, Cocamidopropyl Betaine, Glycol Distearate, Cocamide MEA, Laureth -10, Pantenol, Inositol, Cystine, Cysteine, Biotin, Methionine, Sodium Chloride, Fragrance, Citric Acid, Benzophenone-4, Tetrasodium EDTA, Methylchloroisothaiazolinone Solution, Methylisothiazolinone Solution, Blue 1, Glycerin, Cetyl Alcohol, Caprylic/Capric Triglyceride, Polyquaternium -7, Behentrimonium Methosulfate, Certrimonium Chloride Solution, Cetearyl Alcohol, Tocopheryl Acetate, Aloe Barbadensis, Dimethicone, Camellia Sinensis, Hydrolyzed Wheat Protein, Hydrolyzed Wheat Starch, Polysorbate 20 and Propylene Glycol. Also read: Natural and organic hair growth products – why they are the best! In order for you to make an educated decision over whether you buy this shampoo, I have gathered some reviews from the internet, which will show the positives and the negatives. The manufacturer do say that the shampoo needs to be used daily to have the most effect, so you have to take into account that some bad reviews might be due to people not using it properly and take everything you read with a pinch of salt anyway. Nisim do recommend that the shampoo is used every day (or at least every 2 days) and that failure to do this might not show good results. However, as you will see from some of the Nisim fast shampoo reviews, the result of using it so aggressively can risk damage to your hair. Since using ‘FAST’ my hair has grown so much (2inch per month approx) and has never been in such good condition, I am actually amazed! Finished chemo about 4 months ago and already my hair is thick and over an inch long! It might work it might not, however makes me feel like it does :). Worth every penny. After using almost every hair growth product on the market I finally purchased and used this one. In three weeks my hair has grown one inch and is still growing. I can honestly not believe it. If your hair grows slowly, it will grow longer, faster, but it’s not going to add Rapunzel inspired locks immediately to your head. Let’s be honest here. That’s just unrealistic. Just a quick update on my experience using fast shampoo for the past week, I’ve noticed tonight while putting coconut oil throughout the length of my hair that all the little baby hairs along my hairline have seriously grown a lot longer, some I didn’t even know existed it’s so strange!! It’s been little over a week and although I dislike having the wash my hair everyday it seems to be working. Testimonial at the NISIM FAST website. I just wanted to let you know I think your F.A.S.T. shampoo and conditioner are great products. I have curly hair that never seemed to grow. I’ve tried other products that never seemed to do what they claim to. I gave F.A.S.T. a shot. I’ve used it for a month and a half and my hair has grown at least an inch. It is wonderfull to find something that really works. I wanted to say thanks. I used this product for the better side of a year, and it did nothing, apart from ruin my hair. Dont waste your money. Had such high hopes for this after reading the reviews. But immediately after using it I could tell I made a big mistake It was like washing your hair with acid. This product has taken all the moisture out my hair . After the first wash my hair felt different , and because it was drying out my hair it was causing more split ends and frizz. I used it and wasn’t that impressed! Also my friend who has dyed dark hair said it completely stripped her colour out! DONT DO IT!!!!!!!!!!!!!!!!!! Seriously! bought this a couple of years ago (insanely short hair cut too traumatic 2 describe) and it was a complete waste of money. Not only did it not make ANY difference 2 the length of my hair it left it feeling really… gross. Does FAST Shampoo really work? I have been looking on YouTube to see if I can featured a video that shows a non-positive review of the FAST shampoo, but to be honest, I can only find good ones! I suspect that, based on the content of the videos, that Nisim offer free trials to people under some obligation of doing a video review? After all, there are many health and beauty YouTube’rs out there, so getting them to do video reviews of the shampoo working, would be great for Nisim. What do these reviews make you think? Are these FAST shampoo and conditioner reviews enough information to help you decide to use it or not? I would be interested to hear your thoughts on if you think this will work as a hair care product, or one that might be the best shampoo to help grow hair.